Fishing forums are a great way to learn about fishing and improve. Fishing forums are also fun for sharing our fishing trips with others. So it gives me great pleasure to announce that BaitSoaker now has a Fishing Forum where you can go ask questions, share photos of your fish, talk about your fishing gear and so on! I am giving away red hook Panther Martins, Lucky Craft Pointer, Mepps Aglia, Rapala floating lure in a rare color, HD Trout in a rare no longer made ghost white color and more. Free Lures for Joining and Posting! There are two ways to win a free lure. To encourage you sign up and be a part of the fun, I am giving away free lures to a random member with ten posts. Everyone who registers has a chance to win! As a special giveaway, I am also giving away lures to the first twenty members who sign up and rack up at least ten posts. Please do not register more than one membership, I can tell if anyone’s cheating. Everyone has a chance. Even if you’re not a part of the first group of twenty. I am picking at random a member with ten posts to give a lure to. 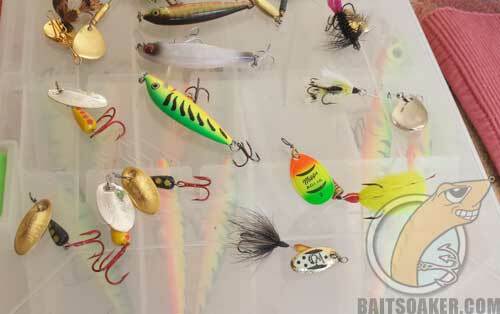 Here are photos of just some of the lures from my own collection that I’m giving away. There are two lures that are in rare colors. The first one is a Rapala floating lure in a rare color. It’s made in Finland I think. There is also a very rare HD Trout lure in a ghost white color that is no longer made. They stopped making these about seven years ago and I bought some of the last ones they had in stock. I’m also giving away some of my red hook Panther Martin lures. These are all original red hook lures with genuine silver and gold plating. These are some of Panther Martin’s best lures for trout and all freshwater game fish. I’m also giving way Rooster Tail lures. You must have at least ten posts to qualify. Everyone who registers has a chance to win as soon as they have ten posts. Then you will have a chance to win a fishing lure. If you are among the first 20 members to register, you automatically qualify for a lure. Once you reach ten posts I’ll contact you for your name and address and send you the lure! Members from the original 20 will still qualify for an additional lure if they continue being a member and posting. Anyone registering more than once is disqualified. All feedback about the fishing forum is appreciated. If you want me to create an additional category let me know and I’ll consider adding it! Looking forward to seeing you at the BaitSoaker Fishing Forum! 2 Comments on "Fishing Forum and Free Fishing Lures"
Looking for a lure that is best fir sticked lake trout. Been using a kastmaster as well as a plastic grub, not getting hits like I did on simple worms, what am I doing wrong? 1. Sometimes it’s the weather. If it’s too warm the fish will congregate away from shore. 2. Sometimes the fish are relating close to the bottom, which means your kastmaster and grub may be too far above them. Slowing it down or using a different kind of spoon like the Little Cleo, which can be slowed down may work better. 3. Sometimes the fish want a lure that doesn’t move much, in which case you might want to try floating a Powerbait Mice Tail (check out my article on that). Really, the Powerbait Mice Tail is a truly killer bait when fished on a sliding sinker rig.